BoLASEPaKO.com - a simple view on Singapore Soccer: Stay Focused, BOYS!! 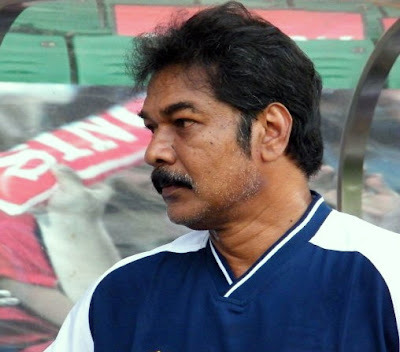 After his team defeated Balestier Khalsa, Young Lions' coach Terry Pathmanathan (pictured above during the "Sultan of Selangor Cup 09") was not a happy man as you thought he would be. In the post-match media conference, the former national skipper remarked "some of the boys are getting big on their heads that they need a knock on it." In short, the ex-Tampines Rovers stalwart blasted his boys for not playing according to plan and making many unnecessary moves in the game. 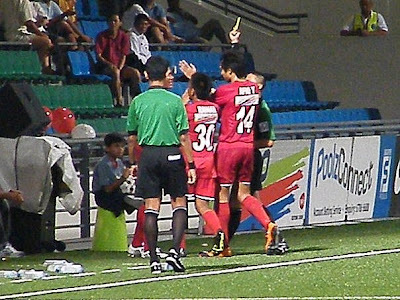 Young Lions' striker Khairul Nizam's (hidden by the fourth official) "over-the-top" goal celebration warranted an unnecessary yellow card in their recent match against Balestier. "During my time after I scored a goal, I get back to my position and game carry on." said coach Terry when asked if the "over-the-top" goal celebration antics by Khairul Nizam was one of the sticking points. "I have nothing against goal-celebration, but they must learn not to overdo." he added after Khairul was warranted a yellow card for taking off his jersey in that wild celebration. 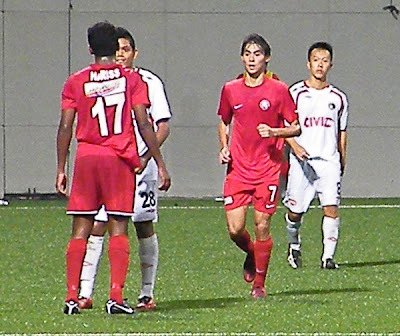 Balestier (white) have the slight advantage over the Young Lions in retaining their talented players, if the former choose to do so, whereas the latter have to release a player who turned 23. Indeed, wise words from someone who had been and seen through how mentality of players evolved over the years. Getting easily complacent has always been the problem local football facing, which nobody has a remedy for that. The game is full of unavoidable physical contacts, but it's equally important to stay cool and out of trouble with whosoever. 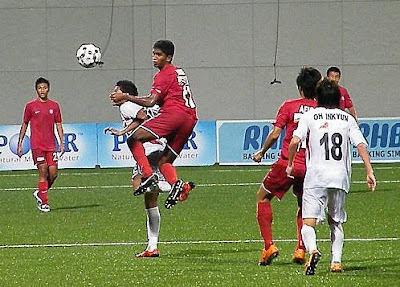 On the other hand, cellar-dwellers Balestier's youth-priority policy may not have won them any honour since the founding year, nonetheless, this is THE club that wouldn't hesitate to throw in a group of untested youngsters to hone their game at the highest level. Unfortunately though, it's also the club policy of "not blocking players' advancement" should there be a better offer elsewhere. 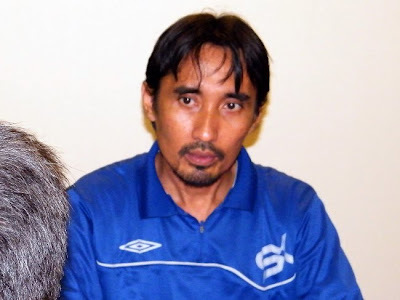 Balestier coach Nasaruddin Jalil (above) remains positive all the time, despite all the downs. Therefore, at times I do feel sorry for the club, not because their inability to win any cup or title, but for the fact that some of talented youngsters they groomed "faded away" the moment they leave the Toa Payoh outfit (you all should jolly well know who are the few, if you're a keen follower). "Would you rather stay in the club that groom you, in order to be a better player, playing with the same group of guys whom you toiled together these years to achieve something in the end (unless circumstances beyond control)? Jump the ship when there's better pay offer to play with a group of established "stars" to improve your game?" To be fair, results on the papers don't reflect the actual performance - Balestier may be at the foot of the table, but they always gave their opponents a tough fight, what lacking now is just that bit of experience and luck in front of goal (like the above missed chance from a corner). No doubt about it, everyone loves to play for a better team, however, if a top team decided that buying instead of grooming players is the way to success that you can't blame the same teams dominate the leading spots at the end of the season, since players groomed by minnows would ended up elsewhere. So where you want to improve your game? Feel your conscience and ask yourself. The players must understand that leaving for a bigger club doesn't necessarily means you will get better. 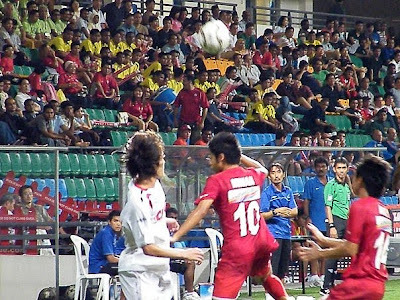 At a development stage, players need to play as many competitive games as possible. The right time to move for a player is when they are at their prime, 28 to 30? Balestier is my hometown team but if players leaves and didn't stay, how to fans connect? Time for Balestier to stop selling players and develop them into one solid team. Sometimes, it is for their own good. I told coach Nasa before that what a pity that some of those potential players "faded away" the moment they left the Tigers..
Look thru' the list of them has any of them progress on a smooth passage way?